The Kissed Mouth: Thursday 7th December: Ecce Ancilla Domini! I do love a title with an exclamation mark in it - makes the whole business so much more dramatic. I should have gone with that for my books. Actually, from now on I shall be Kirsty Stonell Walker! I like to sound like I startle people. Anyway, cracking on with today's annunciation, we have Rossetti's classic, one I've featured here many a time and I'm sure is well known to you. 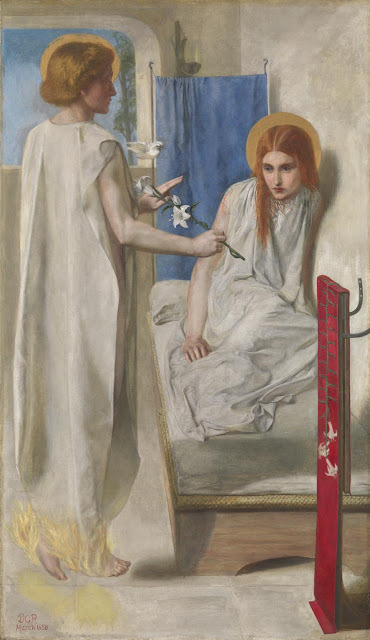 Mary (in the shape of a ginger Christina Rossetti) is cowering on her little bed while a fiery-footed angel does some of that womb-pointing which is wholly unnecessary and a tad personal. Behind her is a drape of blue, referencing how Mary was the only figure in religious art that was important enough to splash out on lapis for. In the foreground are even more lilies, this time tumbling through a startlingly red background, no doubt hinting at the passion to come. 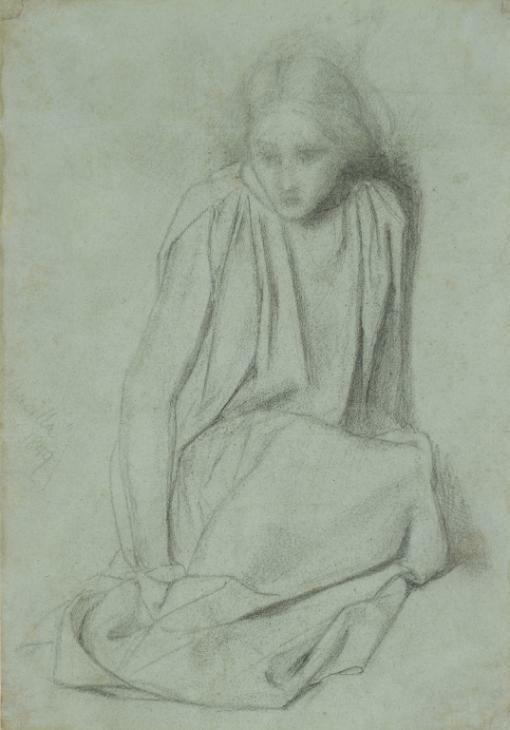 Of course, that wasn't the first time (or indeed the last) that Rossetti depicted the Virgin Mary. It could be seen as a sequel to The Girlhood of Mary Virgin and indeed it is the same red embroidery she is working on, whilst being bothered by the angel who just won't leave the plant alone. It's enough to put you off your stitching. I can't imagine it is the same angel who turns up in her room later. Exactly how long did it take her to stitch that? 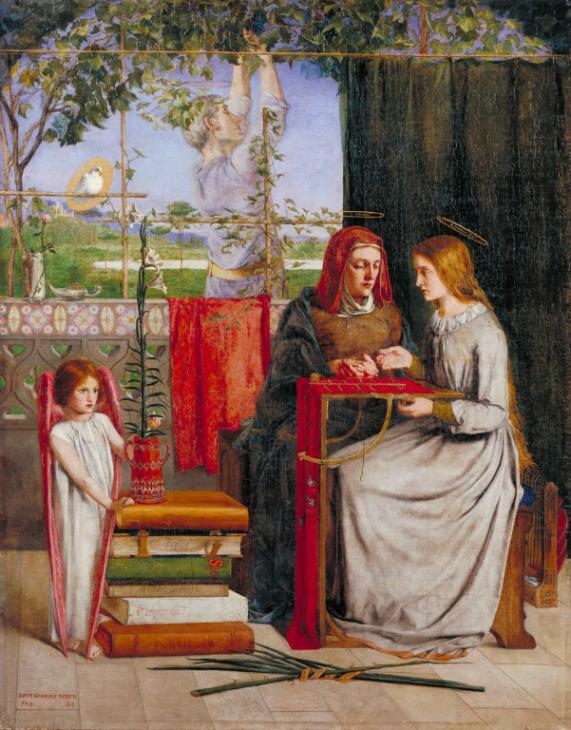 I like Rossetti's annunciation because perversely it doesn't look nice. 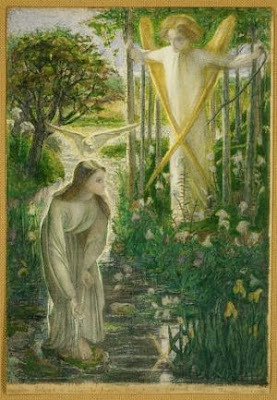 Mary looks small and cornered and the angel (modelled for by William Michael Rossetti) looks very manly and big. It's a small breathless little room, not the great outdoors, and she is a skinny little girl with an angel gesturing at her lady parts. It's a strikingly honest interpretation of the text, and one that bears comparison with Millais' Isabella and the brother's foot pointing violently at his sister. The angel doesn't look violent, just matter of fact. Oddly, that is the one thing the whole situation isn't. It's meant to be magical, extraordinary, there are many ways the image could be dressed up to hide the bare fact of the matter. Rossetti doesn't do that. He just puts a little girl in a white room with nowhere to run from her destiny. Best of luck to her. Ecce Ancilla Domini is by far my absolute favourite Annunciation depiction EVER! The only one that captures the terror of an angelic encounter, that shows Mary as a very young teen (as she most likely would have been), and that makes her acceptance of the message even more extraordinary. I had a print of this on my wall at college, and it's no less powerful today than when I first encountered it over 35 years ago.